WordPress has made it to the 25% mark and Genesis is powering 164000+ websites. That makes for interesting numbers. The open source nature of WordPress and the flexibility offered by Genesis as a framework invites a lot of developers to get started. This can be a good thing and a bad thing at the same time. The good thing is that the entry level to WordPress and Genesis has become so low, that even a non-developer can start serving the clients right away. All it takes is — install WordPress, pick and choose a Genesis child theme (or any WordPress theme for that matter) for the look and feel, install and configure the plugins and widgets and you are good to go. You don’t need to be an expert… frankly speaking, you don’t even need to be a WordPress or Genesis developer. This has resulted in a grave situation — a scenario wherein a noob calls himself a developer and builds a website powered by WordPress for as low as $5 (you will find a lot of them of fiverr.com). And freelance sites like Upwork and Freelancer are doing well at establishing new lows for the webdesign industry. The greatest loss from this is for the clients and businesses who fall for cheap work. This is a classic example of “You get what you pay for”. The websites designed by so-called “developers” lack on several fronts. Poor coding standards, regular maintenance work, security loopholes, un-managed site architecture, half-baked SEO are some of the glitches. Your website is your personality and a representative of your business; it drives the sales mechanism for you 24X7, 365 days. You have to be a little thoughtful about handing over the responsibility of building the website. Hire a seasoned WordPress developer to make the most from your website. Here are some of the attributes and tips to help you identify the right guy for the job. A seasoned WordPress Genesis developer has thorough knowledge of WordPress and knows in and outs of Genesis framework. He is well-versed with WordPress and Genesis. He know about the WordPress and Genesis specific hooks and filters and knows how to GREP for the missing information. He is not restricted to working with existing Genesis child themes. He will be open to the idea of building you a custom child theme if the use case demands one. Attention to details is one of the key attributes of a qualified developer. While coding the Genesis child theme, plugin or a custom website for the client, he will be particular about following the coding best practices to make sure his creations work beautifully across the platforms. A successful web developer always look forward. He keeps himself updated about the advancements in the field of technology and internet. Other than core technologies like CSS3, HTML5, SCSS, WordPress REST API, WordPress 4.4, jQuery, he is well informed about digital marketing, social media management, e-mail marketing, Google webmaster tools, web analytics and the likes. All these are a part and parcel of the bigger landscape called “Website Design”. An expert knows what he is doing. Unlike noobs, he doesn’t consider your website as the playground for learning things. He has done his homework well and is in a good position to advise and suggest what works and what does not work in various scenarios. Quick Tip: To assess the developer’s expertise, ask the questions over the mail or schedule a call. Present your case and check out the way he handles your queries. Prompt and professional communication makes the seasoned developer stand out. An experienced Genesis developer will clearly be able to tell you if you need to go with a pre-made child theme or you need a custom child theme to handle the features and functionality required by the site. The task of WordPress developer is not only to install WordPress and set-up a theme. It goes far beyond that. It encompasses all the features required to run a successful website that looks good, ranks for the right keywords and generates revenue. Accordingly, a competent WordPress developer from experience knows quite a lot about UI/UX, has good understanding of SEO concepts and practical knowledge of implementing them, has first hand experience in building site architecture that helps your site in rank better. And hiring a good WordPress developer is a blessing in disguise. He will help you at each step in taking informed decisions for your site. Right from setting up SEO plugins to measuring the performance of the site, a good developer does it all. They know the caveats with Genesis SEO settings and will install a sound SEO system in place, will configure caching plugins in such a way that the site loads in flick of a second and will ensure that the site can sustain WordPress updates and is maintenance-free & future-proof. To streamline the work process, developers use and build several tools to be more productive. And over time with experience they become confident in sharing their tools with other fellow developers in the community. Good developers have a lot to share with the community and actively help the beginners to catch up with the platform. 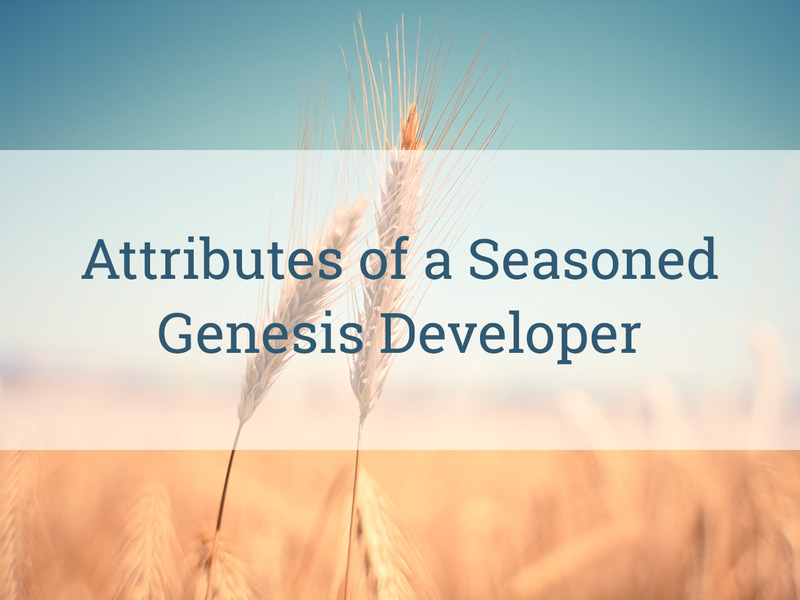 Genesis developers for example share tutorials (Sridhar Katakam for example), build code snippets (Bill Erickson for instance), help others in groups and forums (FB group and StudioPress forums) and submit framework specific plugins to WordPress repository. Quick Tip: If you have doubts about hiring a developer, just check out his contributions. It will give you a fair idea about the developer’s level of expertise. Last but not the least, well built case studies and client testimonials speak volumes about the developer’s work. With each new project, theme, plugin, etc an experienced developer goes on building loyal clientele and a strong fan-base. They don’t necessarily have to be on the “recommended lists”; their clients do a word-of-mouth marketing for them.